Matinee jacket or sweater: 36-41cm 100g, 46-56cm 200g, 61cm 300g. Hooded jacket: 36cm 100g, 41-51cm 200g, 56-61cm 300g. DK tension 22st/ 28 rows to 10cm 4mm needles. 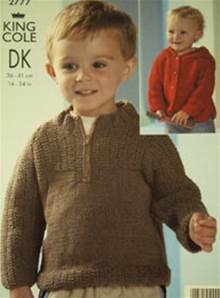 Suggested yarns King Cole Comfort DK, Splash, Wicked or Merino Blend DK (likely to require extra). 3.25 and 4mm needles. 4 buttons for matinee jacket, 4-5 buttons for hooded jacket.